Lapageria or ‘Chilean Bellflower’ plants are a little bit of challenge to grow but well worth the effort. They have large waxy bell like flowers that hang down from a small vine. Flowers are usually red or white, however pink (pictured right) and even multicolored flowers have been cultivated over recent years. Not readily available but worth visiting plant and garden shows to find. Also known as Copihue and Copiu they are the National flower of Chile and a are shade loving climbing plant. A fantastic climber with large pendant red to white waxy bells, leathery leaves on a twining vine from late summer to autumn. The native habitat is cool mountainous with deep soils. The main trick is to maintain a moist cool root system and let the plants climb into the light. Another essential is a good frame for this twinning climber to attach itself to, it seems to sulk if the climbing situation is not easy for it. One of the worlds most beautiful flowers, if you live in a cool to temperate region Lapageria rosea, or Lapageria alba is well worth a try. Lapagerias grow well in the cooler mountain areas of Victoria, New South Wales and Tasmania, easy care in the right conditions. In the Dandenong ranges we have seen them growing well along a wire mesh fence. In New South Wales they seem to thrive in the Blue Mountains at Mount Tomah. It is not the aspect that matters so much as the cool root run and protection from the hot afternoon sun. 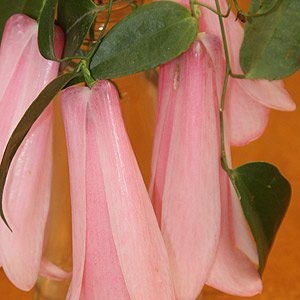 This does not mean that Lapageria will grow in deep shade, in fact they can struggle to flower without adequate light. In ideal conditions these wonderful plants can reach up to 5m in height, they do prefer a slightly acidic soil, so a soil PH 6 or slightly lower. A few years ago Lapagerias received a bit of a bad rap in Australia, it seems that some were sold with a virus that meant they really struggled. However this seems to be sorted and they are certainly worth a try. Pruning is generally not required as these are a slow growing plant, once established you may wish to snip of a few flowers to show off indoors. A warm moist position with a cool root run, they do like a little humidity. Well drained but moist and good drainage in winter. A good structure to climb on. Allow the plants into climb into the light. Keep away from hot afternoon sun and windy positions. Lapageria seen to perform well with an Azalea fertilizer. We use a pine bark mulch as well. Yes they grow well in containers, again remember the climbing frame. They do not like to be moved, they will sulk if the root system is disturbed. Keep Lapageria plants well mulched and watered during the warmer months and protect from slugs and snails. 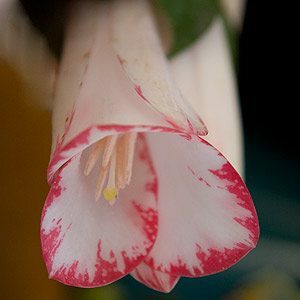 Generally you will find varieties such as the deep pink to red Lapageria ‘Rosea’ and the white flowering ‘Alba’ available. Although named cultivars such as ‘Sangre de Toro’ and ‘Quelipichum’ are becoming available they are difficult to find in Australia. The difficult part of growing Lapageria from seed is finding fresh seed. Ideally you would try to obtain a ripe seed pod, and remove the seed when you are ready to plant..
For best results a bottom heated propagation tray with a misting system would be used. Sow seeds in individual pots and cover lightly with a medium grit. Use a azalea potting mix for good results. Seeds should germinate in 1 -2 months and will need to be grown on in pots form a year or so. Keep seedlings frost free and water with a liquid seaweed fertilizer. Reds, Pink and White varieties – Mail Order to all states except TAS and WA.